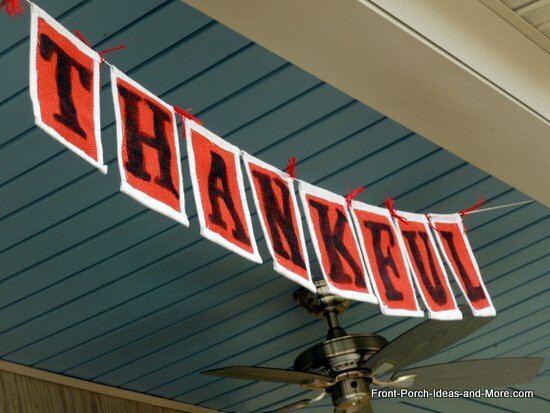 I've always wanted to create a Thanksgiving garland for our porch - one that spells out something fun or inspirational. 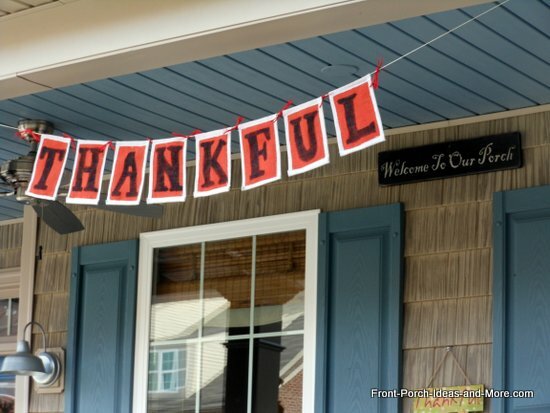 Since both Dave and I love Thanksgiving AND we both believe that being grateful is key to a happy life, we thought that creating garland that spells "T H A N K F U L" is perfect for us. How about for you? 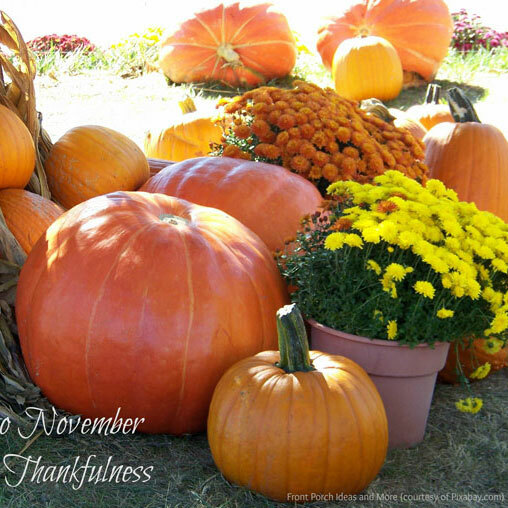 What word or phrase sums up your feeling about Thanksgiving? 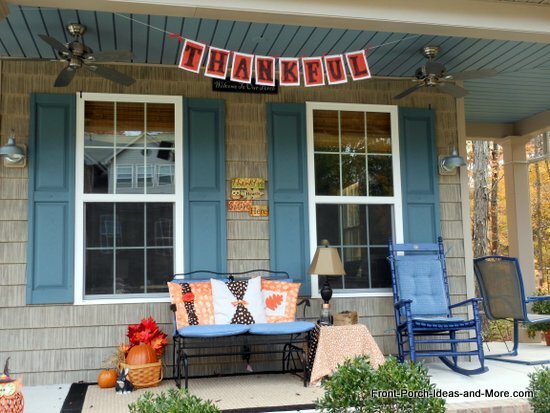 I made our Thanksgiving garland from burlap, a swatch of painters drop cloth and a little black paint. You could use a permanent marker instead, if you like. Read through all the instructions before starting your garland. Burlap - a yard would be more than plenty. You probably could do it with much less. 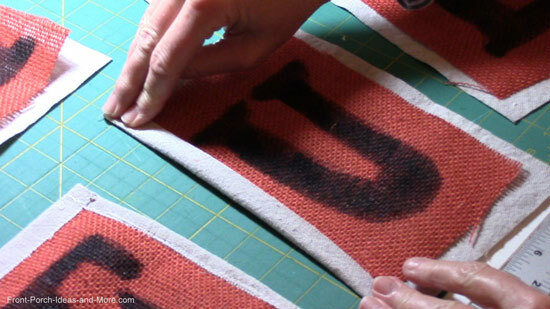 Depends upon how many letters in your banner and what size your letters will be. I only used about 1/4 of a yard. Decide upon the size of your letters. 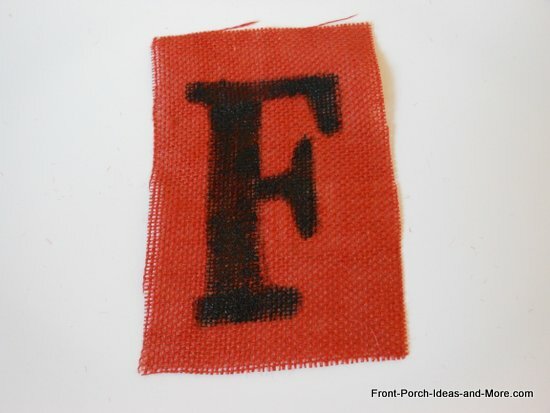 Since ours is a banner on the porch, I wanted to be sure you could read the letters from the street. Our letters are about 5" tall. 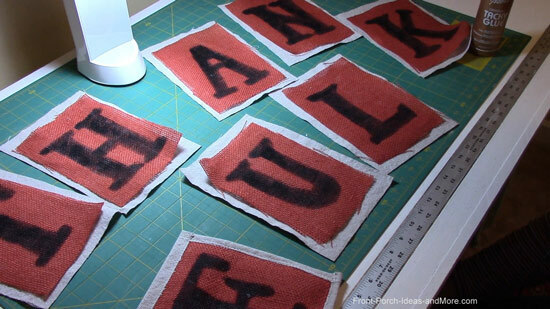 Cut out burlap rectangles about two to three inches taller and two to three inches wider than your letters. I made our rectangles to be 8" tall by 5" wide. You need one rectangle for each letter. 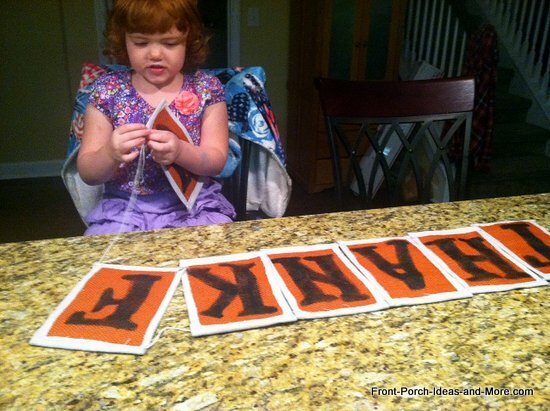 Draw your letters onto the burlap rectangles using your stencils and a marker. Or outline them by hand using your marker. I found a free alphabet online. I downloaded one letter from it ("F") and then I hand drew the rest of the letters using the "F" as a guide. I didn't print out all the letters only because I didn't want to use that much ink. Fill in the letters with a black marker or paint. I used a flat-bristled paint brush. It was easy to stay inside the outline. 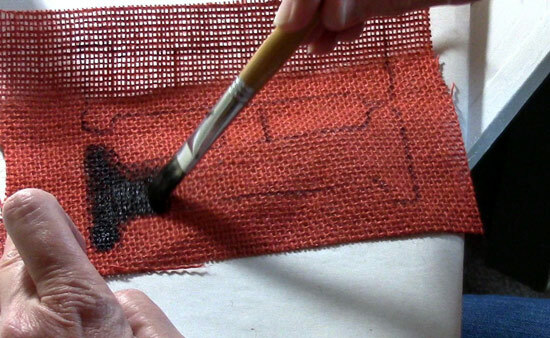 Be sure to protect your work surface as the paint or marker will seep through the burlap. Here you see how a letter looks when it is filled in. Cut out rectangles of the backing fabric that are about 1" taller and 1" wider than the burlap squares. One rectangle for each letter. These will be the backing of your letters. Center the burlap squares upon the background fabric. Fold the sides of the background fabric toward the front. 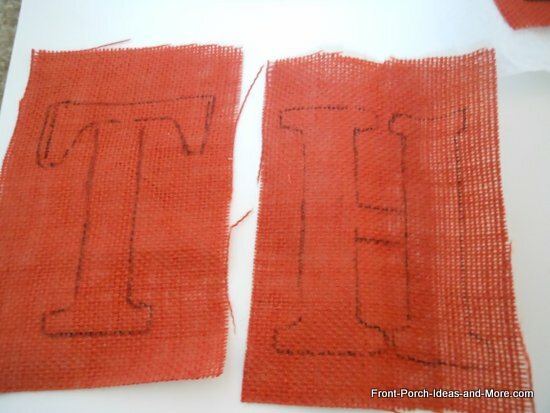 The only caveat is to fold down the top edge last and leave a channel on the top for the twine to pass through to connect the letters. So if you are gluing, only glue the edge. To complete the garland, connect the letters by passing twine through the top channels. Here you see our granddaughter, age 4, pulling the twine to connect the letters. I put a loop at the end of the twine and had her pass a crochet hook through the little channel at the top to catch the loop and pull it through. Or you could put a safety pin at the end of the twine and pass it through the upper channel of each letter. It's easy stuff. See the little raffia bows between each letter? I like putting a little space between each letter. I tied a raffia bow in between each letter to not only give it a little extra color but also keeps the letters from moving together. Leave a good length of twine on both ends so that you have options when it comes to hanging your banner. 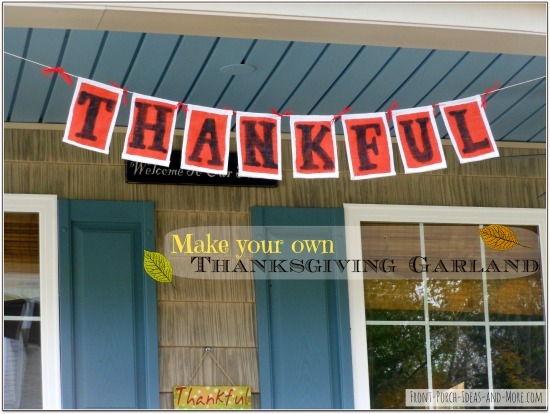 Using the free ends of the twine, hang the banner from your porch, on your foyer wall or across your fireplace mantel. Of course, be sure it's not too close to a flame. Do you enjoy burlap crafts? If you made something from burlap for your porch, please share your pictures with us. Make this Thanksgiving turkey (link below) and use it inside or out. After we painted it, we added a little brown paint to give it a vintage look. 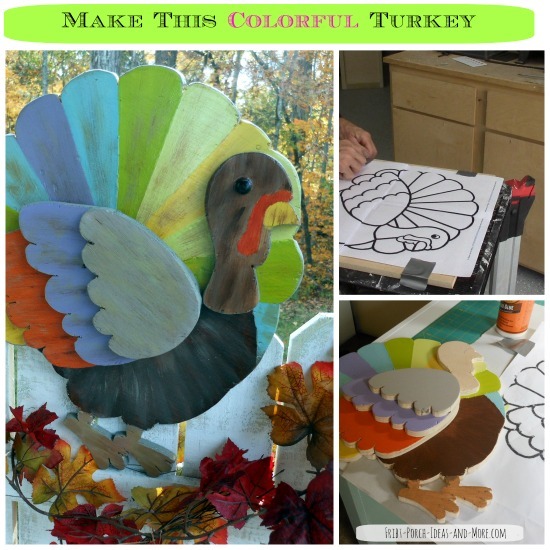 We have a tutorial for you to create our wooden turkey. He's very cute!